Allen & Heath have enjoyed incredible success amongst pro jocks with their Xone: 1D and 2D performance controllers. They have a reputation for being able to take a beating at the club and still work the next day with great sound output. The K2 takes some of the form factor (layout, spacing) from the 1D/2D and applies it to a new lower profile design. The K2 looks very enticing, indeed. Small footprint, four faders, and assignable controls that could be used for DJ performance as well as DAW control. While the Traktor X1 does offer custom mapping (and I’m a fan of the mixer control template in particular), this new Allen & Heath device offers faders – a staple of may performers / producers’ needs. In addition the K2 boasts an audio interface and headphone output – making this this smallest dj controller with sound capabilities I’ve seen so far. If the sound quality lives up to the A&H legacy this should be a product worth checking out when it releases this spring. Xone: K2 has a high quality internal, four channel (2 stereo) soundcard. Universal controller and is perfect for use with all leading DJ software, such as Traktor Pro, Ableton, Virtual DJ, PCDJ and M ixVibes. Xone:K2 can even be used to control lights or VJ software – if it can receive MIDI data it can take commands from K2. 52 physical controls – including 12 analogue and 6 endless rotary encoders with push switch, 4 linear faders, and 30 backlit performance switches – providing up to 171 MIDI control commands across 3 layers. What each control does is entirely up to you – with a little thought you can create a completely customised layout that perfectly fits the way you want to work. We also provide some sample maps and information on how to set up your own. Latching Layers – By assigning controls to multiple layers you can give a single physical control up to 3 functions. You can configure all, some or none of K2’s controls to be linked to the latching layers system. As a quick visual reminder, when toggling through layers all switches assigned to a particular layer will illuminate in the appropriate colour. 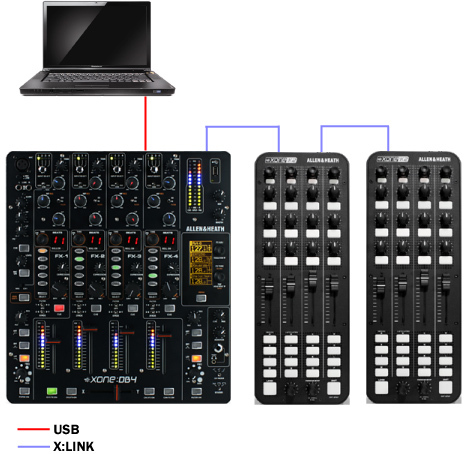 X-Link – Two K2s can be linked via Allen & Heath’s X:LINK protocol, giving twice as much control capability. X:LINK uses a standard RJ45 connector and distributes power and data, which means two K2s can be connected to your software using only one USB port. 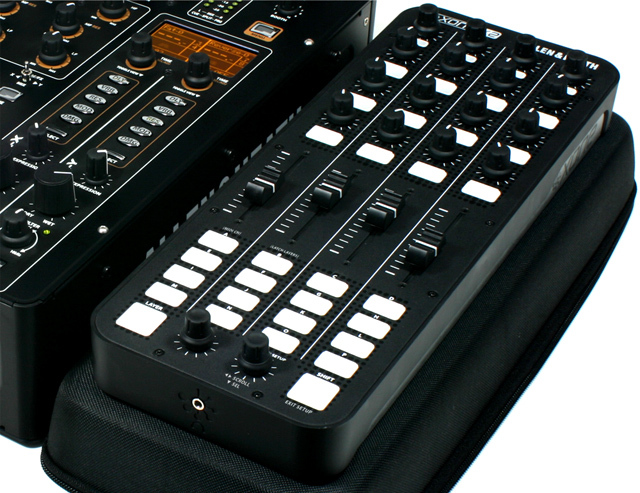 X:LINK also allows connection to Xone:DB4 and Xone:DB2 mixers. Case / Stand – Xone:K2 comes packed in a robust black padded case as standard. As well as keeping it safe on the road, the case doubles as a stand, bringing the K2 up to the same height as most pro DJ mixers.